I know as soon as I drive over the bridge (a one-way bridge, mind you, that curves high over the ocean below) that there's something special about Sommarøy. Call it a vibe, maybe. Or the feeling that I was being let in on some kind of secret. This small island about an hour outside of Tromsø in Northern Norway is indeed a bit secret. It's somewhat popular as a summer getaway with local Norwegians, but has yet to make it onto the tourist radar for many others; they all flock to the Lofoten Islands further south. There are barely any cars in the parking lot of the Sommarøy Arctic Hotel when I pull in, despite this being high season in Norway. When I go to have dinner at the hotel's restaurant, I'm one of three people there. I order my meal at the bar and sit at a table overlooking the bay, marveling at the view. And the silence. I barely even care that I've just paid $35 for a piece of fish. Later, I make my way over to the , where I'm supposed to do a Midnight Sun kayaking tour. The problem is that it's cloudy and raining and there certainly won't be any midnight sun to see tonight. But I decide to go anyway, not least of all because I want to learn a bit more about the people who call this island home. I meet , owner of 69 Nord. He's a French transplant and a polar explorer (no really, this guy has sailed the North West Passage and visited both poles more than once!) who now calls this little island in Norway home. 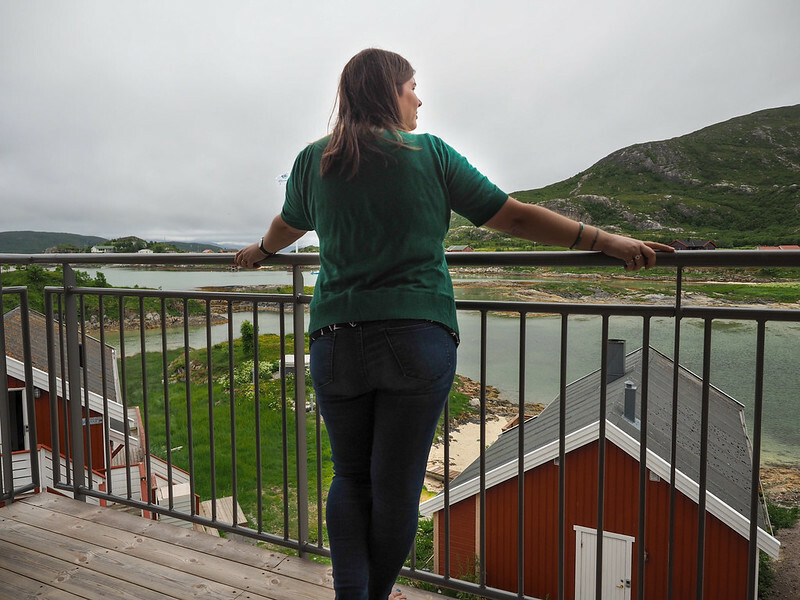 The first time he visited, Sommarøy reminded him of other parts of the world that he loves. “It's still wild,” he says. And so he decided to stay and eventually opened up an outdoor company. 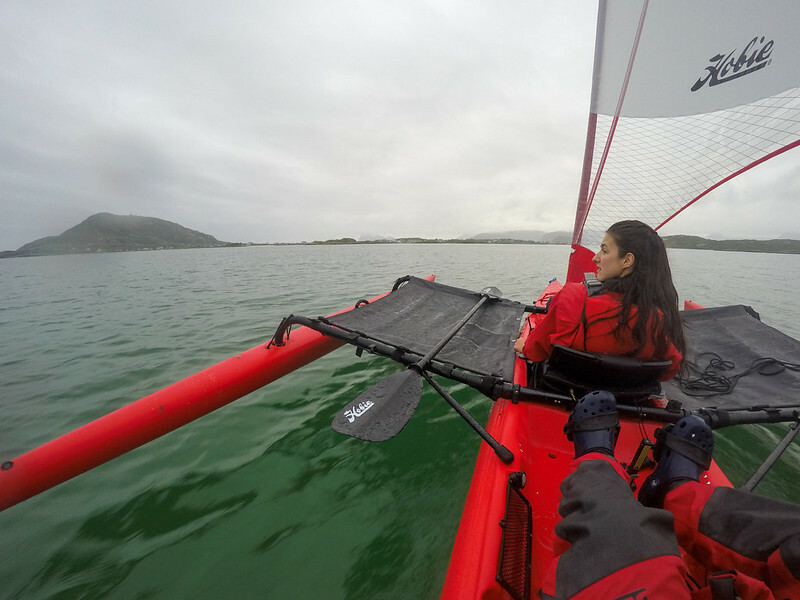 A French girl takes me out for an adventure in a Hobie kayak – a kayak with two pontoons like a catamaran, a sail, and paddles that you pedal kind of like a bike. It's still raining, but we head out to one of the very small islands that surround Sommarøy anyway. In our Hobie Kayak – so much fun! The water is bright green even under a cloudy sky, and we land on a white beach with sand made mostly of coral. The only inhabitants are birds. We both marvel at the color of the water, and how clear and clean it is. Look how clear (and green!) the water is! I truly feel like I'm being let in on a secret; getting a glimpse into a completely different world. The next morning, I drive back across the one-way bridge, glancing into my rearview mirror multiple times. I joked with my partner, Elliot, the night before that if I never came home, this was where he'd be able to find me. I drive back to the main highway that leads back to Tromsø but almost immediately pull over again. I had learned about a quick hike that you could do to a viewpoint overlooking Sommarøy and its surrounding islands, and decided I needed to do it. The “mountain” (it's really more of a hill) is called Ørnfløya. The hike is a short 2 kilometers round-trip, with an elevation gain of only 150 meters (just under 500 feet). And the views at the top are amazing, even on a moody day. The water looks like it belongs somewhere in the Caribbean, doesn't it?? Even now, weeks after my visit there, I'm still thinking of Sommarøy. I can't quite put my finger on exactly why I loved it so much, but I think it's definitely a combination of the pure natural beauty there and the fact that I felt like I was discovering something that most people don't know about yet. I honestly debated whether or not to even write this post; I almost decided to keep the secret to myself. In the end, though, I think Sommarøy is deserving of your attention (and your tourist dollars). Northern Norway is, after all, much more than just the Northern Lights and the Lofoten Islands. So please, go to Sommarøy and learn the secret for yourself. You can drive to Sommarøy from Tromsø in about an hour. The roads are a bit windy and can be narrow at times, but are generally well-kept. 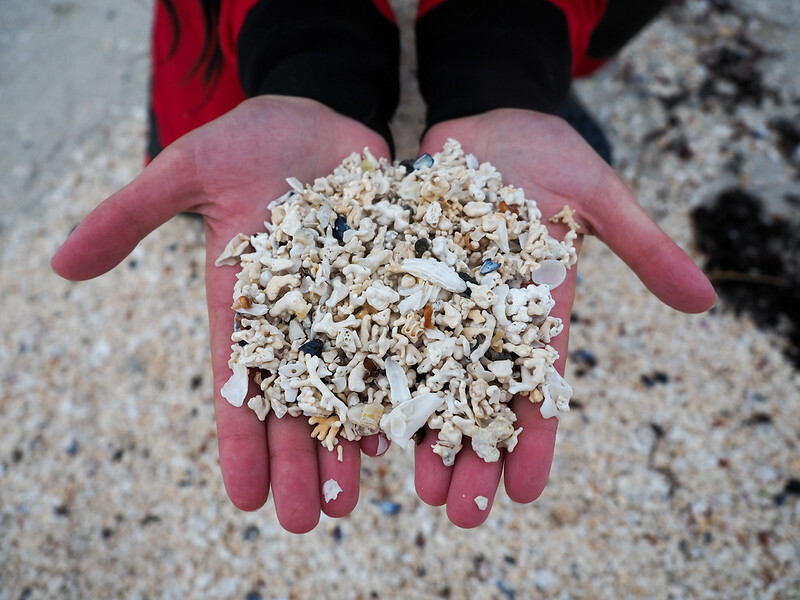 Who's ready to discover the secret of Sommarøy for themselves? *Note: My visit to Sommarøy was in partnership with Visit Norway and Visit Northern Norway. As always, though, all opinions are 100% my own. I’m glad you think so! Some people can’t see the beauty in places when it’s raining, but I still found Sommaroy stunning! It can be more of a challenge to take good photos when it’s raining/really overcast, but there’s certainly no denying that this place is beautiful, regardless of the weather! The waters do look so serene and dreamlike! Sommaroy definitely looks like a different Norway. It’s different to the parts of Norway you usually hear about (i.e. the fjords) for sure. I loved it. Wow. It’s stunning. It sounds right up my alley – and while I wouldn’t have even considered a midnight kayak trip, it looks like something that I must do if I make it up that way! If you’re there in the summer, definitely! The Midnight Sun is so strange if you’ve never experienced it before! How can the water be so clear? The north of Norway & Sweden are rising in my wish list, so I’m sure I’ll go check it out sooner rather than later! Very few people = very little pollution. Hence super clean and clear water! Northern Norway is such a beautiful part of the world. Wow – what unique beauty in the landscapes of Norway! Your photos of the sea are amazing, and yes, it does look like the Caribbean (a little colder though I imagine). But the Caribbean sea in the Bahamas has a different kind of beauty, although equally as breathtaking. Thanks for sharing! So quiet and serene. A place to just enjoy nature, going for long strolls, hiking, and the change of seasons. 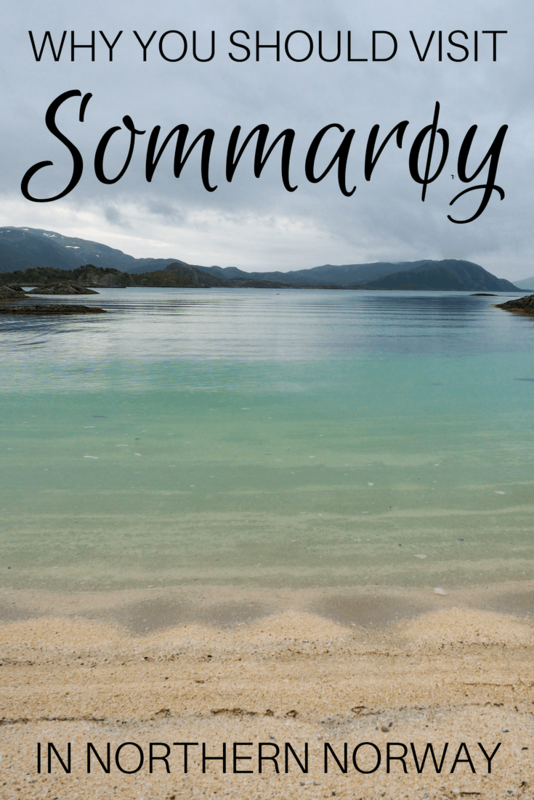 I think Sommaroy is a place that would still be exquisite, even if it were raining! Norway is on my bucket list for sure. Thanks for posting these vignettes of your travels in Norway! It’s one of my favorite places to travel – mostly because there are so many beautiful places to see!